Water and fuel line clamps. 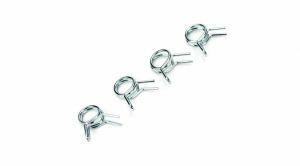 These are a spring steel clip for use on OSE 1/4" Outer Diameter sized silicon tubing. The clips insure that the fuel line cannot slip off the fitting. Excellent for pressurized fuel systems. INCLUDES: Four clips per pack.